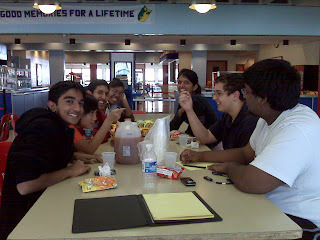 The Principal's Advisory Group held its first meeting of the year after school in the cafeteria. The group, which meets every other Friday in the cafeteria, holds an open forum for students to bring comments or concerns about BHS to the Principal and other building administrators. I-pod use - The new policy which allows students to use i-pods or other Personal Entertainment Devices (PED's) at the discretion of the classroom teacher, between classes, and at lunch has been appreciated by students. They have not noticed any problems as a result of this change. Guidance time for seniors - The seniors present mentioned difficulty in getting in to see their guidance counselors due to their full schedules during the first semester. Library - The students mentioned that it is sometimes difficult to get access to the library due to the fact that it is so widely used and wondered about a possible group study area for students who are working on large group projects. Daily Announcements - Some students mentioned that they do not always catch all of the announcements during homeroom period and wondered about additional ways to make these announcements accessible. It is hoped that a link to the daily announcements will be available on the school webpage by the end of next week. We will also post a hard copy on the window in the main office. Student feedback to staff - One student who has been taking courses at the college level asked if it would be possible to fill out teacher feedback forms in order for teachers to gain insights from their students on what is going well and what is not. The students were informed that this is not something that can be mandated, but that a form could be recommended for staff to use at their own discretion. In fact some teachers are already soliciting both formal and informal feedback from their students. Thanks to the students for a great list of items to start with. Our next meeting will be on Friday, October 31 at 2:15. As the parent of a sophomore, I read your blog reularly , either weekly or every other week. It gives me a window into the high school that I did not have before. It is educational for me. I would not take the lack of comments as lack of interest but would also encourage you to advertise the blog, perhaps by writing to the Burlington Times Union and mentioning it at all school functions.